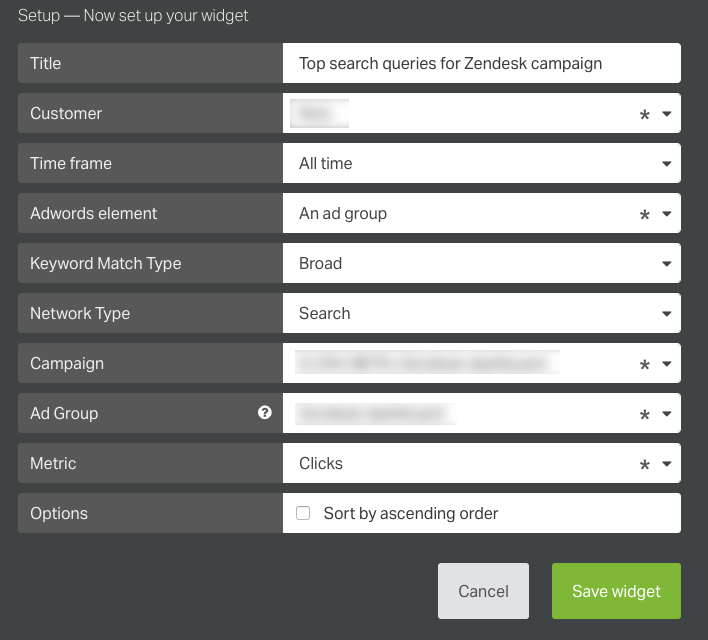 In this article, we'll show how to display information from your Google AdWords data on your Geckoboard dashboard. If your Google Ads widget is missing data (empty), check if you have a browser extension such as AdBlock, AdBlock Plus installed. Follow our instructions on how to unblock *.geckoboard.com/*. Not sure what you'd like to show with AdWords data? Take a look at our AdWords marketing dashboard example. Which metrics and visualizations are available for Google AdWords? Display a list of the top performing search queries for a particular keyword over a given timeframe. This can be shown for an ad group or campaign and a specific metric can be chosen to denote how performance is judged. The list can be sorted in ascending or descending order. Display a list of the top performing locations for an ad group or campaign over a given timeframe. A specific metric can be chosen to denote how performance is judged and the list can be sorted in ascending or descending order. The locations listed can broken down at a country, region, city, quarter or metropolitan area level. Search for Google AdWords using the Search sources field. Alternatively, you can also scroll down the alphabetical list of integrations until you reach the Google AdWords integration. Click on the Google AdWords integration. Select the widget you'd like to add from the gallery of available widgets. Is this is your first Google AdWords widget? You'll need to connect the Google account used to manage this to Geckoboard. 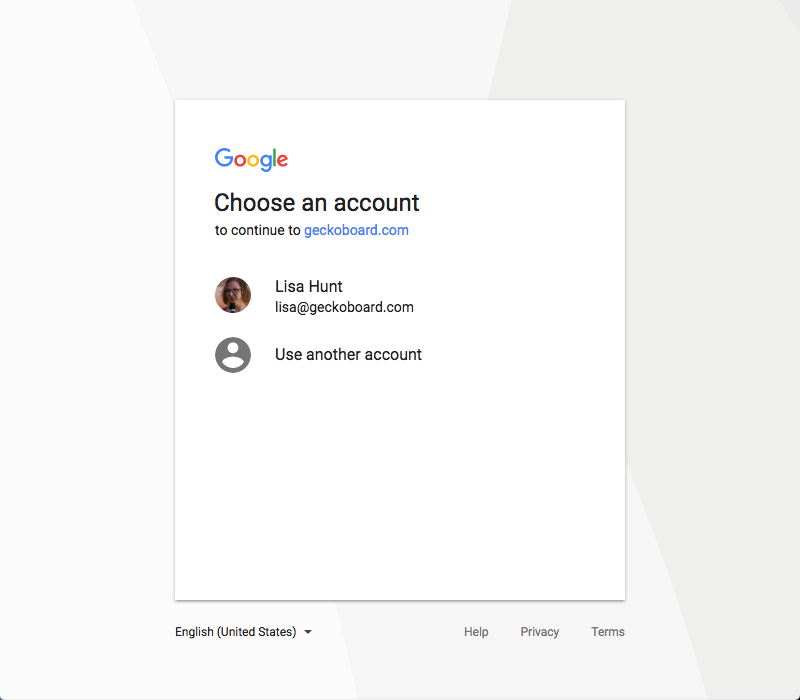 If you manage more than one Google account with a connected Google AdWords account, you can also connect multiple Google accounts to your Geckoboard. If you've already connected to the correct Google account, you can skip to configuring your Google AdWords widget.. 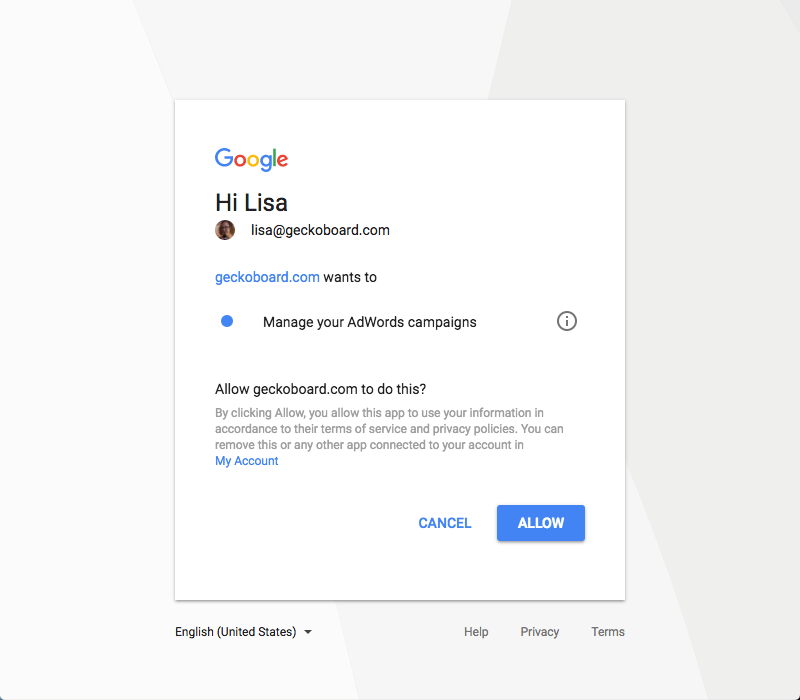 When adding your first Google AdWords widget, you'll be asked to create a connection and authenticate your Google account so that we're able to collect your data and display it on the dashboard. You only need to create this connection once for Google AdWords – we'll take care of the rest. The authentication box will first ask you to name this connection to your Google AdWords account. We recommend using a meaningful name that will allow you to know which Google account it is connected to and distinguish it from any other connections you might make. Click on the Connect via Google Adwords button. A popup window will appear and allow you to log in to your Google AdWords account. If you're not signed in to Google, you'll see a prompt to do this. If you're already signed in to Google, you'll see the logged in account at the top of the list or can choose to sign in to a different account. 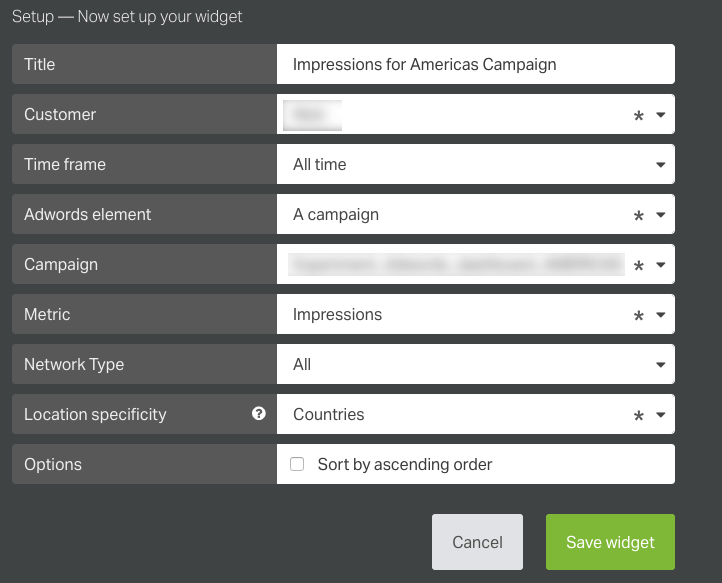 You'll then see a prompt asking you to allow Geckoboard to manage your Google AdWords campaigns. 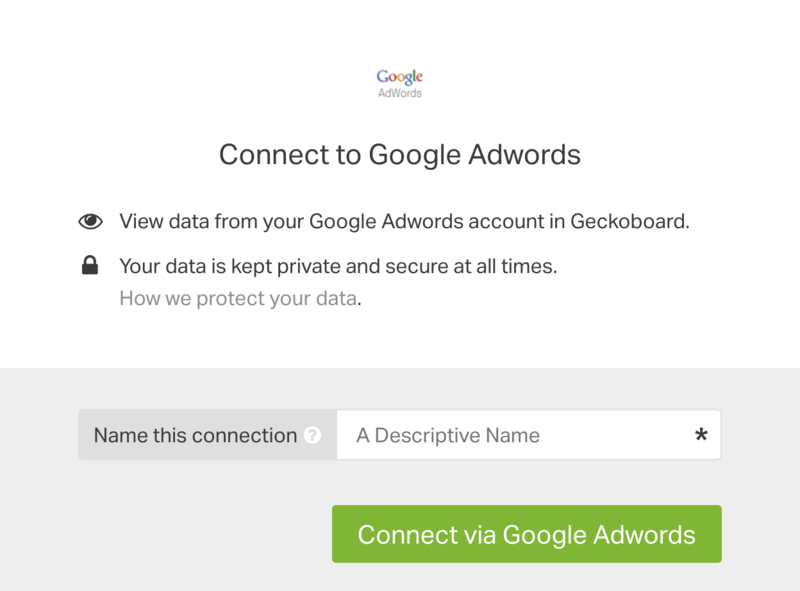 Geckoboard's application will view the information in your Google AdWords account and access it via the API to display on your dashboard. We won't change any data or campaigns and the staff here at Geckoboard won't have access to the connection unless you give us explicit permission to do this for troubleshooting purposes. You're now ready to configure your first Google AdWords widget! Check that this option shows the correct connection for the Google account that you would like to use. This can be set to any text you'd like to create the title element of the widget, or left blank if you would prefer not to include a title. Select the particular AdWords instance within the Google account that you would like to show data for within the widget. Select the particular period that you would like to show data for, from the list of available time frames. Select whether you would like to show data for a particular campaign or ad group. 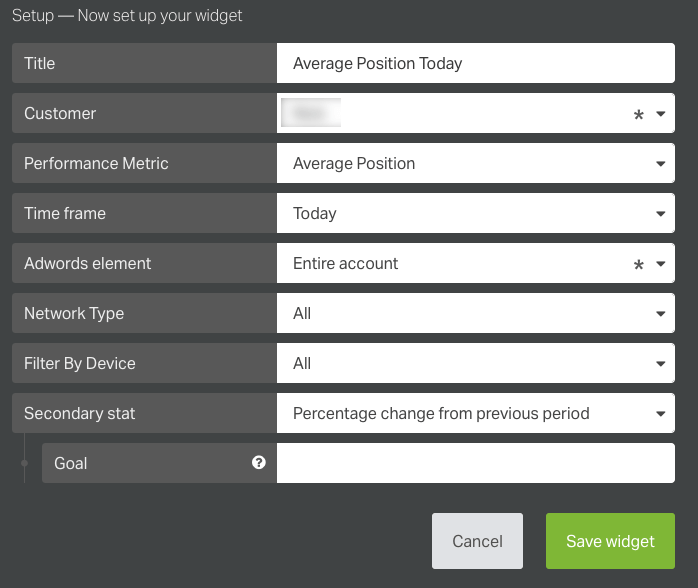 With the Performance Metrics widget, you can also select either the entire account or a particular ad with this option. If you've specified which elements of Google's network your ad or campaign appears on, you can select this here or use this option to view only performance in one particular element. Select the metric that you would like to show from the dropdown list of available Google AdWords metrics. If you would like to see data for only tablets, mobiles or desktop or for unknown devices, you can select this option here. Optionally, add a metric to appear as a secondary element on the widget below the first, such as a comparison to the previous period. If you have specified a particular keyword match type within the AdWords campaign, you can select this here or use this option to view data for all keyword match types. Select the AdWords campaign that you would like to show data for, from the list of available campaigns. If you have selected ad group within the Adwords element option, you should choose the ad group that you would like to show data for, from the list of available ad groups. Select the metric that should be used to judge the performance of the keywords when ordering the data within the widget. The value of this will be shown below each keyword in the list. Lists are sorted in descending order by default. Check the box here to sort in ascending order instead. Select the metric that should be used to judge the performance of the locations when ordering the data within the widget. The value of this will be shown below each location in the list. Select how you would like the locations to be shown, from the list of available options.